Our daughter was not in the mood to take down the tree and put away the Christmas decorations. I can sympathize with her; I felt the same way. December seemed to rush by like the wind. Next thing I knew our son was back at school and we were going about the day just as before. So I went searching for another tradition. I most certainly was not looking to add another tradition but the Twelve Days of Christmas seemed like a perfect ending to all the excitement we experienced over the past month. 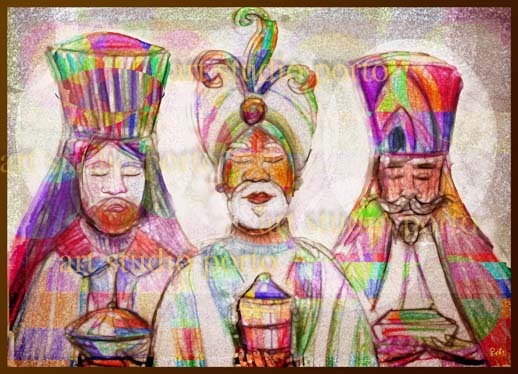 The Day of Epiphany, Three Kings Day or Christmas is celebrated in Europe and in many Latin countries on January 6th as apposed to December 25th. The feast commemorates the arrival of the Magi or Three Wise Men to the manger where the baby Jesus was born. The Magi, similar to Santa, leave gifts under a tree or in socks or shoes to symbolize the offerings of gold, myrrh and frankincense by the wise men. In return for the gifts from the Magi children will leave straw or hay under their beds or in their shoes for the camels. Three King’s Day represents the close of the Christmas Season. There are many ways families celebrate the 12th Day of Christmas; however the tradition of serving a King’s Cake is the most constant of them all. The King’s Cake or Epiphany cake is baked with a trinket or bean inside. Whoever gets the piece with the trinket reigns as king or queen of the feast and gets to order everyone else around for the day. In Mexico the winner is in charge of buying the tamales. Traditional cakes can be a type of sweet bread shaped in a round (France), a pound cake or cake in the shape of a crown or a round pastry with a gold paper crown (Spain) set on top. The cake may be decorated with colorful candies or frosting. For many families January 6th is the day they take down all the Christmas decorations. One family prepares pinecone bird feeders a few days before to hang on their tree. Once all the decorations are removed they set the tree outside to feed the birds. The bird seed is their small gift to the birds. Kristen, a mom I met at the playground one day told me all about their Progressive Christmas Cocktail tradition. They start out at her sister’s house for French Onion Soup. Then travel to her mother’s house for horderves. Finally everyone gathers at Kristen’s house for martini’s. The idea of traveling from place to place seemed to fit with the theme of the traveling Wise Men. I thought it only befitting that we could incorporate my favorite Christmas Eve read, The Littlest Angel. His gift was not made of sparkles or gems but was comprised of the warmest memories of earth: A butterfly, a stone and his dog’s collar all tucked gently away in a worn wooden box. Our cake? A wonderful Eggnog Pound Cake. Lastly, we come up with this year’s goals (our gifts) for both family and personal. How do you celebrate The Day of Epiphany?